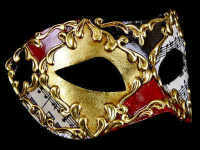 Chic multi-coloured panels with gold swirl designs......Stunning Venetian masquerade mask. 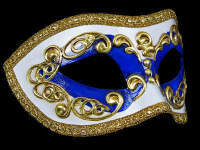 We love this Color mask here at Simply Masquerade as its so simple yet a brillant design. 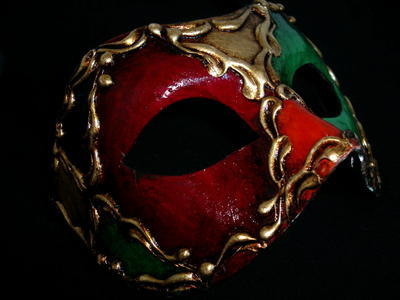 Excellent aged antique gold/red/blue/green & orange panels segmented with beautiful gold swirl designs......Stunning party mask. With black ties this mask is perfect for men or women to wear with any outfit but we feel it would suit something dark or black so to make you stand out even more. 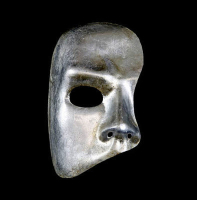 The mask of course is designed & hand made and painted in Venice.